The comprehension of the flower descriptions and of the opening chapters will be facilitated by the reading of the following explanation of terms. For words or expressions other than those which are included in this section, the Index of Technical Terms at the end of the book should be consulted. The Root of a plant is the part which grows downward into the ground and absorbs nourishment from the soil. True roots bear nothing besides root-branches or rootlets. A Tuber is a thickened end of a rootstock, bearing buds, - "eyes," - on its sides. The common Potato is a familiar example of a tuber, being a portion of the stem of the potato plant. A Bulb is an underground stem, the main body of which consists of thickened scales, which are in reality leaves or leaf bases, as in the onion. 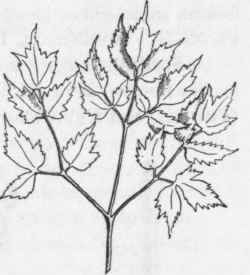 A Simple Stem is one which does not branch. A Stemless plant is one which bears no obvious stem, but only leaves and flower-stalks, as in the Common Blue Violet and Liver-leaf (Pl. LXXXIV.). 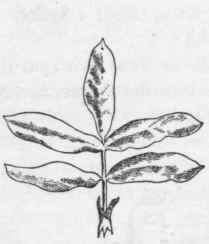 A Scape is the leafless flower-stalk of a stemless plant. (See Liver-leaf (Pl. LXXXIV.). A Compound Leaf is one which is divided into leaflets, as in the Wild Rose, Pink Clover, and Travellers' Joy (Pl. XXXI., also Fig. 2). A Much-divided Leaf is one which is several times divided into leaflets (Fig. 3). The Axil of a leaf is the upper angle formed by a leaf or leafstalk and the stem. Flowers which grow from the axils of the leaves are said to be Axillary. A cluster in which the flower-stalks all spring from apparently the same point, as in the Milkweeds, somewhat suggesting the spreading ribs of an umbrella, is called an Umbel (Pl. LXXXI.). A Spadix is a fleshy spike or head, with small and often imperfect flowers, as in the Jack-in-the-Pulpit, and Skunk Cabbage (Pls. CII. and CIV., also Fig. 4). A leaf or flower which is set so close in the stem as to show no sign of a separate leaf or flower-stalk, is said to be Sessile. The green outer flower-cup, or outer set of green leaves, which we notice at the base of many flowers, is the Calyx (Fig. 6 Ca). At times this part is brightly colored and may be the most conspicuous feature of the flower. When the calyx is divided into separate leaves, these leaves are called Sepals. 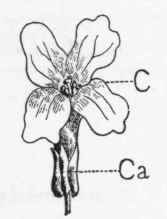 The inner flower-cup or the inner set of leaves is the Corolla (Fig. 6, C). When the corolla is divided into separate leaves, these leaves are called Petals. We can look upon calyx and corolla as the natural tapestry which protects the delicate organs of the flower, and serves as well, in many cases, to attract the attention of passing insects. In some flowers only one of these two parts is present; in such a case the single cup or set of floral leaves is generally considered to be the calyx. The floral leaves may be spoken of collectively as the Perianth. This word is used especially in describing members of families where there might be difficulty in deciding as to whether the single set of floral leaves present should be considered calyx or corolla (see Lilies, Pls. XLV. and LXXX. ); or where the petals and sepals can only be distinguished with difficulty, as with the Orchids. The Stamens (Fig. 7) are the fertilizing organs of the flower. A stamen usually consists of two parts, its Filament (F), or stalk, and its Anther (A), the little sac at the tip of the filament which produces the dust-like, fertilizing substance called Pollen (p.). The Pistil (Fig. 8) is the seed-bearing organ of the flower. When complete it consists of Ovary (O), Style (Sty. ), and Stigma (Stg.). The Ovary is the hollow portion at the base of the pistil. It contains the ovules or rudimentary seeds which are quickened into life by the pollen. 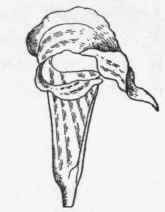 The Style is the slender tapering stalk above the ovary. The Stigma is usually the tip of the style. The pollen-grains which are deposited upon its moist roughened surface throw out minute tubes which penetrate to the little ovules of the ovary and cause them to ripen into seeds. A flower which has neither stamens nor pistils is described as Neutral. A flower with only one kind of these organs is termed Unisexual. A Male or Staminate flower is one with stamens but without pistils. A Female or Pistillate flower is one with pistils but without stamens. The Fruit of a plant is the ripened seed-vessel or seed-vessels, including the parts which are intimately connected with it or them.